This weekend is the Feast of the Baptism of the Lord. The readings can be found here. This Feast is both the last day of the Christmas season and the First Sunday in Ordinary Time. The Baptism of Jesus is an interesting conundrum for Biblical scholars and theologians. This event is contained in all four Gospels and even the most skeptical Biblical scholars believe that it is a historical event. This leads to a more perplexing question: Why would the Son of God be baptized by a human, not to mention a strange societal outcast such as John the Baptist? I believe the answer to this question speaks to the kenotic outpouring of God’s love. God, who is love, wanted to bridge the gap between God and humanity. In order to answer this question the great theologians of the Church remind us of what we call the whole of the paschal mystery, that is, they remind us that Jesus’ Incarnation, life, death and resurrection are of one piece, one whole movement of the divine mystery into the fragility and finitude of humanity so that we might be joined fully to God’s divinity. These theologians point out that Jesus’ baptism is a particular part of this whole, a kind of double submission, another example of the creator of the universe emptying Godself to take the form of a servant, that is, our human form. The first of the two submissions is Jesus’ submission to John, the one who was sent to prepare his way. And the second submission is his acceptance of not just our human flesh (as in the Incarnation), but of our very neediness, our existential thirst for repentance and forgiveness and acceptance. In this way, these theologians read the baptism as another sign of God being Emmanuel, with us fully and completely – this time fully with us even in our need for conversion. 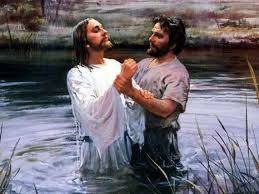 As a part of the whole paschal mystery then, the baptism that we hear in the Gospel today is another way that the creator of the universe says to us: “To be with you I give everything. I give all to you, all my divinity, everything. Nothing will keep you from me.”The question we are faced with today, then, as we stand in the doorway between the season of the Incarnation and the Ordinary season of Jesus’ active ministry, is the same question we are always faced with: will we accept the self-Gift of such a humble God? When I am honest, my own answer is both yes and no. The excitement, the yes, comes because accepting God really means accepting that the words spoken to Jesus today are spoken to us: we are God’s beloved children, with whom He is well pleased. This is who we are at root, beloved children. The reluctance, the no, might come from anyplace beyond that doorway. We might hesitate in the doorway of acceptance because we know who we’ve been in the past, we know those gifts and flaws. But the future? We don’t know that version of ourselves yet. Or we might hesitate because we don’t know whether the gifts we’ve been given during the holidays/holy days will carry over into the rest of our lives. Or we might hesitate because we’re not sure we can trust the voice that calls us beloved, not yet. Or we might trust that voice, but still be afraid because we know where such love leads, to the cross. Whatever it is that handcuffs our hearts, it’s okay. Not okay to stay constrained, but okay to bring our hesitation to a God who gives up all, over and over again, to be who God is: Emmanuel, fully with us, even with us in our existential thirst, our neediness. God asks us – and never tires of asking – to accept His self gift: “Accept me, accept me, accept me.” But he does not force us. Our is not a God who will force us to be beloved. And this for one reason: because God knows what it is to be fragile and finite. Because ours is the kind of God willing to be baptized into our very neediness. It’s because of this that we can trust Him not to break us, bruised reeds that we are. It’s because He is with us this fully that we can trust Him not to push us out the door of Christmas season too quickly, but instead to give us today to stand on the threshold and look out into the world of ordinary time. It’s because we are the sons and daughters of this kind of God that, this Sunday, it’s okay for us to be both ready and not ready, divided, both in and out; to stand in the doorway that leads to the rest of our lives and feel both the fear and the excitement of walking in the ordinary world with a such a God. This entry was posted in Sunday Reflections and tagged 1st Sunday in Ordinary Time, Baptism, Baptism of Christ, Baptism of Jesus, Baptism of the Lord, Catholic, Christmas Season, Creighton Online Ministries, Feast of Baptism of the Lord, First Sunday in Ordinary Time, Fr. Paddy Gilger, Ignatian, Irish Jesuits, Jesuit, Jesuit Post, Jesuits, John the Baptist, Readings, St. John the Baptist, Sunday Reading, Sunday Reflection, The Jesuit Post. Bookmark the permalink. How do I accept others? How do I accept my own self?